The App Store makes it quick and easy to buy and download new software for your iOS device. But for the parents of iPhone-, iPad-, or iPod touch-toting kids, that process might be a little bit too easy. Stories of kids racking up outrageous charges on their parents’ credit cards have grabbed headlines lately, and while Apple has responded to concerns from parents and politicians about the ease of accidental purchases, some of the burden still falls on you to secure an iOS device before handing it off to your child. If your iPad or iPhone winds up in your kids’ hands on occasion, there are a few simple steps you can take to avoid unwanted purchases. First, choose a strong password. If your password is something your child can easily guess, then any other steps you might take will be of limited effectiveness. In addition, remember that there’s a 15-minute window after you make a purchase from the App Store or iTunes Store during which your password doesn't need to be re-entered (and a similar 15-minute window for in-app purchases). Be careful when you give your child your device. Tap Enable Restrictions and you'll be prompted to enter a 4-digit code. Here’s how to entirely disable purchases from the App Store and iTunes Store as well as in-app purchases. Step 1: Enable restrictions Navigate to Settings -> General -> Restrictions. On this screen, tap Enable Restrictions at the top. You’ll be prompted to enter and verify a four-digit code. Remember to pick something that your child isn’t likely to guess: 1234 might be a fine combination for your luggage, but you probably want something a little harder to figure out for your iOS device. This code is separate from the one you use to unlock your phone, but keep in mind that if you choose to use the same code in both places and tell your child the unlock code, they will also be able to disable or change the restrictions as well. You can easily disable the iTunes Store, App Store, or both. Step 2: Disable the App Store and iTunes Store Once you’ve enabled restrictions, you’ll have plenty of options to choose from. If you’re worried about your child installing applications, simply slide the Installing Apps switch to Off and the App Store will be removed entirely from the device (previously purchased apps will continue to work fine). If you also want to restrict their ability to buy media from the iTunes Store, you can also slide the iTunes switch to Off and that ability will likewise vanish. You can also disable In-App Purchases separately. Step 3: Disable in-app purchases Even if the App Store is disabled, your child may still be able to access in-app purchases from apps that you’ve already installed. Fortunately, it’s a simple matter to disable those as well: just scroll down to the Allowed Content section and tap the switch next to In-App Purchases so it says Off. Now, when they go to the in-app purchases section of any app that offers them, no additional purchase options will be listed. If your child is of an age where you’re comfortable giving them the ability to purchase some apps on their own, an iTunes allowance is an excellent way to control their spending. You can set up a separate iTunes account for them, complete with a monthly limit of how much they can spend—and you can even restrict it to age-appropriate apps. In order to set up an allowance, you’ll need your own Apple ID, and it will need to be linked to a credit card. If you have your own iOS device or buy media from the iTunes Store, you already have an account. Keep in mind that since the iTunes Store and App Store use the same account, the allowance will apply to purchases from both, unless you disable one or the other of the stores as per the instructions above. You'll find iTunes Allowances under the Buy iTunes Gifts link. Step 1: Buy an iTunes gift While logged into your iTunes account, open up the iTunes application on your Mac or PC and click on the iTunes Store option in the left sidebar. 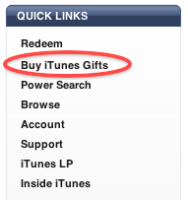 From the front page of the iTunes Store, click on the Buy iTunes Gifts link in the Quick Links box along the right edge. On the subsequent page, scroll down until you see Allowances and click the “Set up an allowance now” link. Step 2: Set up the allowance Fill out the form on the following screen by entering your name, the name of your child, and by selecting the amount of the allowance—options include $10, $20, $30, $40, or $50. Remember that this amount will be charged to your own credit card each month. You can choose to have the amount charged as of the first day of the next month, or charged immediately and then again on the first day of the next month. One piece of good news: if there are any unused funds left over at the end of a month, they will roll over to the next month; that means your child can always save their pennies for more expensive purchases. 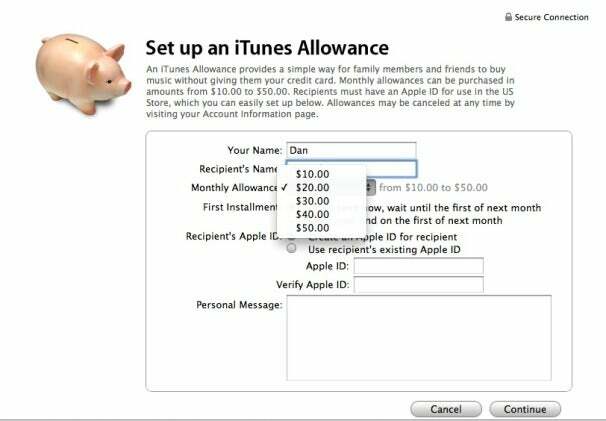 With an iTunes allowance, you can specify how much money you want to give your child each month. If your child already has an Apple ID, be sure and enter it here. If they don’t have one, you can choose to create a new account here. Remember that when asked for a payment method for the new Apple ID, you can choose “None.” If you enter a credit card, anything beyond the allowance that you set up will still be charged. When you’re done, just click Continue. You’ll be asked to confirm the details and then purchase the allowance. Recipients will get an e-mail letting them know that you’ve purchased an allowance for them, as well as how much it’s for; if you chose to have the billing started on the first of the next month, they’ll be notified again when the money’s available. From your iTunes account you can suspend, alter, or remove allowances you've set up. Step 3: Managing allowances You can review your allowances at any time by going to your account settings in the iTunes Store and clicking Manage Allowances. You’ll see a list of all your current allowances, along with the ability to suspend, remove, or change the amount for any of them. You can also create additional allowances from here if you so choose. Under the Allowed Content section of Restrictions you can choose what type of content your child can purchase. Step 4: Select any restrictions Even if you’re giving your kids the ability to buy their own apps, you may still want to have a say in what kind of programs they’re buying. Once again, you’ll visit Settings -> General -> Restrictions on their iOS device. If you haven’t already, tap Enable Restrictions, and choose a four-digit passcode. Under the Allowed Content header you can choose the appropriate rating levels for each of music and podcasts, movies, TV shows, and apps. In each case—except for music and podcasts—you can pick which ratings are allowed, or choose to completely disable all of the media of that type. For music and podcasts, you can simply choose whether or not Explicit material is allowed. And make sure to select the rating system for the country of the App Store you frequent. While there are plenty of challenges facing parents in this high-tech age, managing your kids’ online buying habits shouldn’t have to be one of them. With these simple tips, you should at least be able to make sure that your children don’t spend you out of house and home by buying cartloads of Smurfberries.